Our most popular profile, and also our standard. 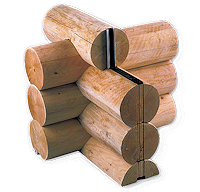 Our 8 x 8 profile features a traditional round log look with a uniform and more tailored appearance. 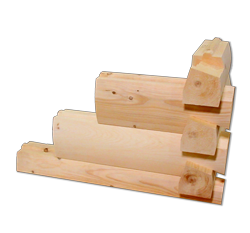 Corners are mortise-and-tenon and profiles are available in a 8 or 6 inch profile. Also available in an optional hand-peeled finish. Our V-Groove features a round exterior and flat interior with a horizontal tongue-and-groove look. 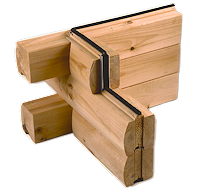 Available with mortise-and-tenon or contemporary square corners, each in our standard 8-inch profile. Also available with an optional hand-peeled finish. The beveled exterior of this 11-inch-high log features a functional drip edge, aesthetic chinking line, and a distinctive corner treatment. Interior is horizontal tongue-and-groove. Available in an optional hand-peeled finish. 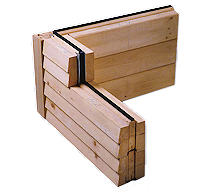 Featuring the classic Dovetail corner treatment, the rounded exterior of the V-Groove Dovetail log profile creates a slightly different look that our typical Dovetail, which is flat on both the interior and exterior. A uniform round profile that is massive and western, it incorporates the traditional "saddle-notch" corner treatment. 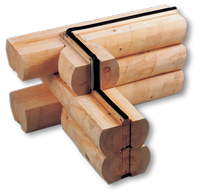 Available in 8-, 9-, 10-inch log diameters. (10-inch pictured in pine.) Available in an optional hand-peeled finish. Traditional clapboard exterior with the benefits of solid 8x8 timber construction and features a contemporary square corner treatment, available in a standard 8-inch profile (3 1/2-inch reveal). 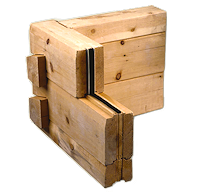 Harkening back to the original REAL™ Log Home, the Rustic profile creates a “classic” log home look. 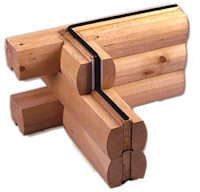 Featuring random diameter logs of 8 to 11 inches and mortise-and-tenon corners, the Rustic profile is a great choice for a log home or cabin in a bucolic setting.